Call Us Today For A Free No Obligation Appraisal! Visit Albarian Jewelry to buy custom engagement rings, vintage jewelry, and collectibles at up to 50% off retail prices! « Do you have gold you’re looking to sell? We pay fair prices! Many people have unwanted jewelry but don’t know to whom take it. People often hold onto their jewelry items not for the sake of wanting them but rather not knowing what else to do with their valuables. As a result, your jewelry just ends up being left unused in your drawers. By finding a reputable and professional gold dealer, like Paul Albarian, you can earn cash in exchange for your unwanted jewelry. Paul Albarian & Associates buys and sells jewelry, gold, silver, rare coins, and precious metals. 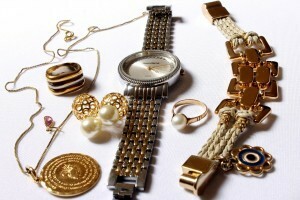 We specialize in estate sales and converting unused jewelry to cash. We serve Burbank, Glendale, Pasadena, Los Angeles, and the San Fernando Valley. Call us at (818) 827-7152 to schedule an appointment. We will give you a no-obligation appraisal on your unwanted jewelry and other potentially valuable items. We offer no-obligation appraisals for your items. By examining your items, we can determine the value your item will sell for and of what we can pay for it. Through years of experience, you can trust that we will offer a professional, honest, and accurate appraisal. We offer private consultations – no evaluating your unwanted jewelry in front of other customers. Call us today to set a same day appointment or stop by for an appraisal. Bring in your item and we can let you know how much it’s worth. We want to provide our clients with a comfortable, professional, and trustworthy experience and we believe a private consultation provides just the right atmosphere. Come in today for a no-obligation appraisal on your items. Come by with your items and we can offer you a no-obligation appraisal. However, if you do choose to sell your items to us, we can offer you cash on the spot. We have worked with many clients throughout the years and they can confirm that we provide fair and honest prices for your valuables. Our customers say great things about us on Yelp! and we have an A+ rating with the Better Business Bureau. Having over 26 years of professional experience in buying unwanted jewelry, we have built a reputable and trustworthy reputation in our business. We are very knowledgeable and up to date about the market value of precious metals and jewelry and can provide you with accurate information about your items. We will guide you step-by-step on the selling process so you can feel comfortable and informed about your decision to sell your valuables. Designed by Jet Set Art & Design LLC.